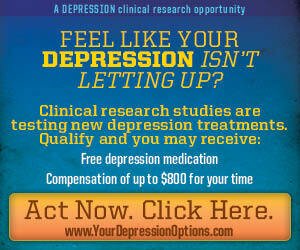 Depression Research Study – $800 Compensation if You Qualify! Here’s an interesting research study that will pay you up to $800 to participate! – Be otherwise healthy without serious disease such as HIV, Cancer, kidney dialysis, etc. Possible Free Depression medication and compensation of up to $800 for your time.